SAIPUA: ammunition for homemade catapults, et. al. ammunition for homemade catapults, et. al. 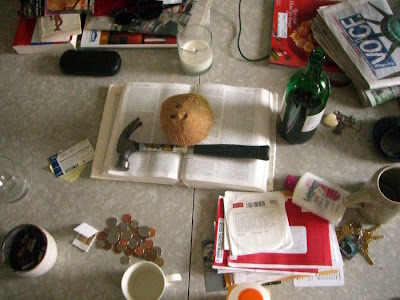 This was the kitchen table two days ago. Aaron has been inspired lately by tropical fruits, and the coconut - the fruit most of us ignore in the market - seems to have caught his attention recently. After a week of idling on the shelf, the coconut was arranged atop JOY with some hardware, Aaron's way of initiating some action. In truth, a fresh coconut smells and tastes like suntan lotion. It's not sweet, and much to my chagrin, there is no milk. The liquid you hear sloshing inside a coconut is in fact water, and it tastes like SPF 35. Incidentally, the addition of Coconut oil to cold process soap is what helps to make a bar lather. So Sunday night, amidst a storm of spontaneous cooking, we diligently drilled into the three holes of the coconut, poured out the liquid and cracked the sucker open with a hammer. 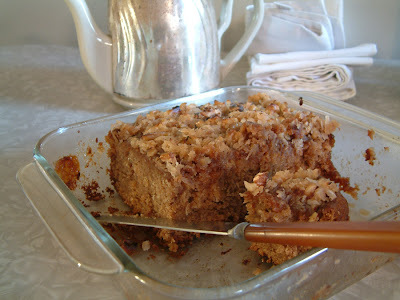 Then I grated up half of it for Lazy Daisy Oatmeal cake, one of the best things to eat in the universe. Pour boiling water over oatmeal. Let stand 20 minutes. Beat butter until creamy. Gradually add sugar and brown sugar. Beat until fluffy. Blend in vanilla and eggs. Add oatmeal and mix well. Sift flour, soda, cinnamon, salt and nutmeg together. Add to oatmeal mixture. Bake at 350 degrees for 50-55 minutes in a 9" pan. Cream butter with brown sugar. Add milk. Stir in nuts and coconut. Spread over cake and broil until bubbly. mmmmmm.... i want some coconut cake. will you sell some at the shop too? s, i'm glad you posted the recipe for the lazy daisy cake. i forgot to ask you for it. yum! Where are they now? Babysitting their grandchildren? If you listen carefully, they have good voices.